Not many can say they’ve created a nationally recognised cocktail. But if you visit the legendary Long Bar of Raffles Hotel you would meet Andy, who was invited by the government to create the Sakura Sling, inspired by Japan and Singapore relations. Those who visit the home of the world-famous Singapore Sling cocktail often leave with great souvenirs of Andy and his crew, making him quite the personality to look out for when in Singapore. How long have you been working in the Business of Happiness? 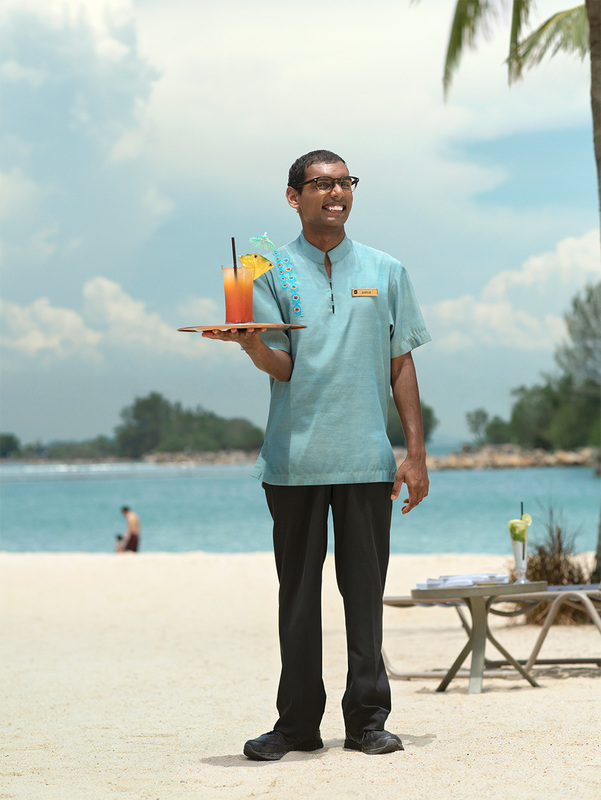 I’ve been working at Shangri-La’s Rasa Sentosa Resort & Spa for 4 years now. I joined the hotel after completing my Work Experience Programme in Delta Senior School – a vocational training institution for students with special needs. In my current role with the Food and Beverage Team, I help to replenish plates, cups and cutlery in the restaurant, as well as assist my colleagues whenever it gets busy. Do you enjoy what you do? Honestly, I’m quite happy with what I do. In fact, I enjoy the busy periods because I get to meet more people. What are some challenges you face at work? Working in a restaurant can be quite challenging. It is a fast paced environment and you’re on your feet most of the time. Despite all of that, my colleagues and I work hard together to give our guests the best dining experience possible. How does it feel to be able to make someone else feel happy? I feel happy, of course. It’s quite satisfying to know that you have the ability to make an impact and brighten someone’s day. Are you very close with your colleagues? Yes, we work closely together and we’ve forged deep friendships over time. In fact, I’m particularly close to my colleague Vera, who is like a mentor to me. We always look out for one another and she has taught me a lot over the years. How do you make a guest feel welcome and happy at the restaurant? It’s all about going the extra mile, to make their time at the restaurant more pleasant and enjoyable. You’re also a national Para-swimmer? Yes, I am. I've represented Singapore in the past few ASEAN Para Games editions and won a silver medal in a relay event at the World Summer Games in Athens in 2011 for the Special Olympics. I hope to represent Singapore again by qualifying for the 2019 ASEAN Para Games, so I’m training hard for it. How often do you train? I train about 4 days a week. Sometimes I also workout at the gym. It’s not easy balancing work and my swimming commitments, but I believe that the harder you work today, the easier it will be to achieve your goals tomorrow. How do you motivate yourself to come to work every day, especially after a day of swim training? Having a job that I love definitely helps, because it makes me look forward to work every day. From time to time, I also like to search for inspirational quotes online, just for an extra motivational boost. Some of my favourite quotes include one by Jerry Rice - “Today I will do what others won’t, so tomorrow I can do what others can’t”, and another one by Michael Phelps - “If you want to be the best, you have to do things that other people aren’t willing to do”. Do you have any words of advice for someone who wants to join the hotel industry? It’s not easy, but it’s fun and worth it! There are also plenty of job opportunities and you will meet a lot of interesting people along the way.